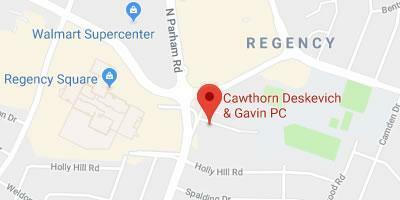 Richmond, VA Law Firm - Cawthorn, Deskevich & Gavin, P.C. Exceptional legal representation in court and at the negotiating table. Our lawyers put the full force of their knowledge and experience to work for you, no matter how complex the legal issue. When you’re satisfied, we’re satisfied. 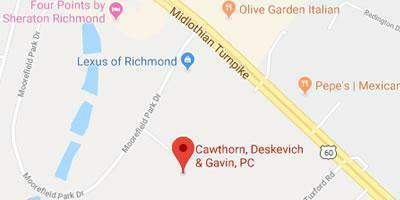 At Cawthorn, Deskevich & Gavin, P.C., we recognize that client satisfaction hinges on a positive legal outcome and exceptional customer service. Our team of attorneys and office staff focus on both to ensure your peace of mind. Our two Richmond offices feel like home to the people who work here. Most of our lawyers have been with us for more than 20 years. We are at ease with one another, collaborating, and inspiring each other to perform at our peak. Clients sense this satisfaction. The moment you walk through the door, you know you have come to the right place for help. We strive to create a safe environment for our clients, where they will feel comfortable sharing serious legal concerns. Since 1979, individuals and businesses have turned to us again and again as their lives and legal needs have changed. No matter how complex the legal issue, the team at Cawthorn, Deskevich & Gavin is here to help. Contact us online or at 804-320-7186 for no-nonsense legal representation you can rely upon.